Scroll down to see our selection of Grippers and Knobs for sale. Grippers and knobs are used by individuals to assist with daily activities. 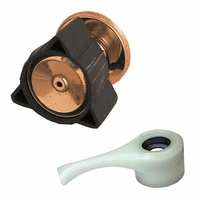 We carry are large selection of grippers and knobs for sale including hand writing aids, door knob helpers, adjustable gripping tongs, key holders, chair risers and much more. What are grippers and knobs? Grippers and knobs are assistive devices used by individuals to aid in daily activities. Grippers help to hold on to and turn jar lids, knobs and faucets. Knob helpers give people the ability to open doors when they are unable to squeeze the smooth handle.